Age is continuous from birth until death. It is a broad equality area, which has implications for all people. Age equality is not just about eliminating discrimination: it means delivering equitable outcomes for people with different needs at different stages in life. Devon currently has a population of 758,100 (Office of National Statistics 2013 mid-year population estimates). 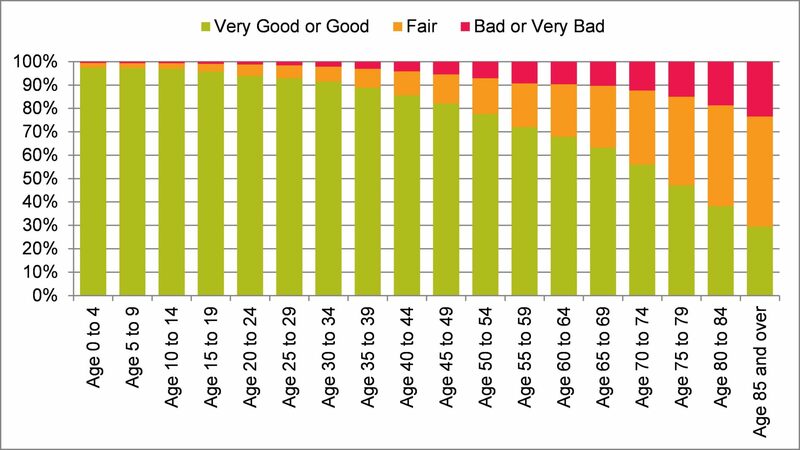 The age structure varies by district with all areas except Exeter showing a lower proportion of 20-40 year olds compared to the England average. Exeter has a slightly younger population structure compared to England, with a significantly high proportion of 20-24 year olds due to students from Exeter University residing in the city. Overall Devon has a higher older population than nationally and this is the age range that is predicted to increase. 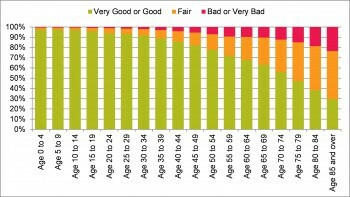 As figure 4.4 reveals health tends to deteriorate with age, with well over 90% of those aged under 30 stating that they were in very good or good health in the 2011 census, compared with 30% in the 85 and over age group. Transitions between child and adult health and care services can also be a factor. It is important to note that the age of transition from ‘child’ to ‘adult’ status varies across services locally and nationally. Services for care leavers and persons with learning disabilities continue until the age of 25, whilst adult services for substance misuse start at age 19, and mental health at age 18. Whilst these transition ages align with national policy and practice, this staggered movement to adult services itself can be seen as a potential risk factor. Thresholds for service eligibility can vary between child and adult services as well meaning that in some cases support may be discontinued. Table 4.2 sets out measures from the Public Health Outcomes Framework and the age groups most affected.